In order to achieve success, retailers and brands need to define performance expectations for their suppliers. However, for many organizations these objectives may currently be poorly defined. With limited performance tracking, views on supplier performance are often anecdotal, resulting in poor decisions. When supplier scorecards are not in place, it’s challenging to arrive at an aligned view on suppliers and their performance. A well developed, implemented and monitored Supplier scorecard is a powerful performance tool that benefits brands / retailers, suppliers and ultimately customers. 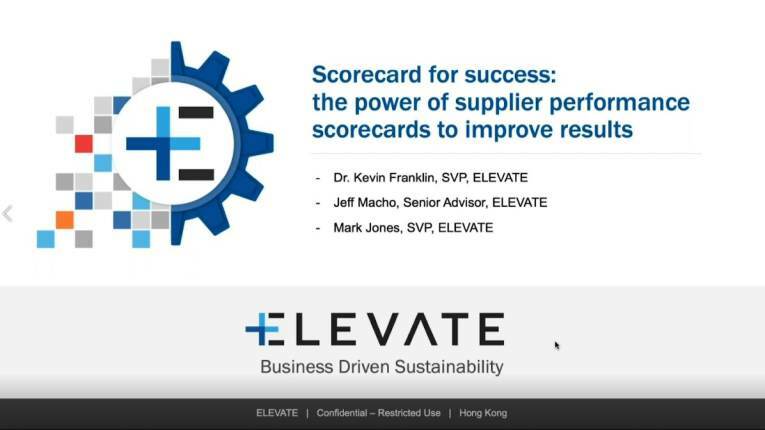 Watch to understand how the impact of scorecards drives a cycle of continuous improvement through better sourcing decisions and supplier performance. ELEVATE’s Mark Jones, SVP, Customer, and Dr. Kevin Franklin, SVP, Consulting & Product, are joined by Jeff Macho, Senior Advisor to ELEVATE. Jeff Macho is a Senior Advisor to ELEVATE and an Industrial Advisor to EQT, a global private equity firm. He has strong experience in global sourcing, supply chain management, quality assurance, social and environmental sustainability in consumer product manufacturing, and multinational organizational design and management. across these functions. Previously, Jeff was Chief Sourcing Officer and European Executive Board Member of C&A, and Senior Vice President of Walmart Inc and Managing Director of Walmart Global Procurement.